While I don’t especially care for yarn that has sparkles or metallic threads, I ended up liking this shawl very much. The wash from gray to black to white and back again is pretty. And a second look—drying after wet-finishing. 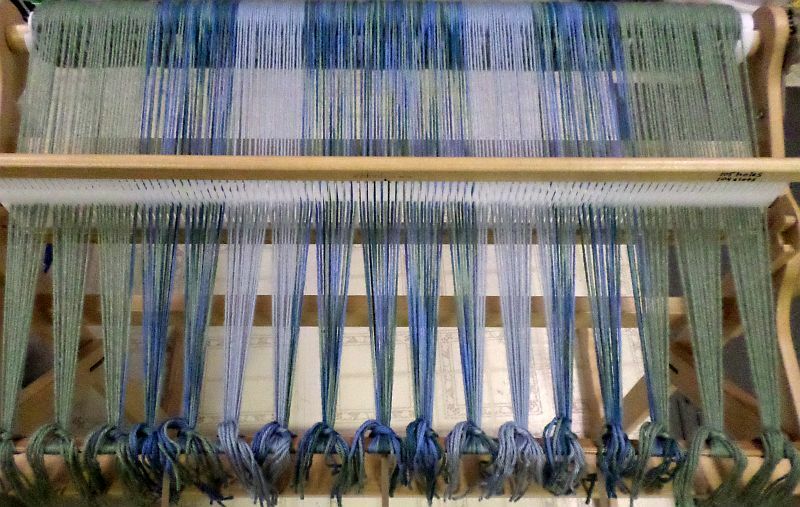 The thing about the rigid heddle loom is that it takes hundreds of yards of yarn to weave a project. I’m used to the 4″ pin loom, which takes 8 yards, or the 6″ pin loom, which takes 17 yards (and that seems like a lot). Of course, if you sew your pin loom squares together, it can amount to hundreds of yards. If. Love the pin loom for trying small yarn combinations for bigger projects. 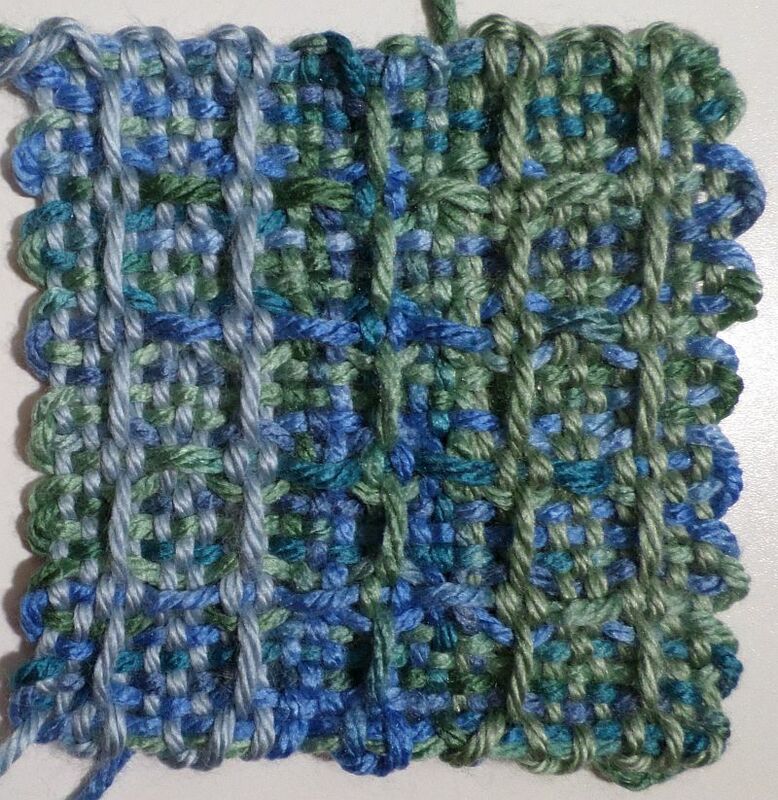 In this small sample I sacrificed less than 4 yards of each yarn color (light blue, green, and variegated). I liked the combination so well I didn’t bother making any other samples. So, I warped up my RH loom. Some time ago I discovered a hack that helps me. I tie the back tie-on bar to the front beam on either side of the heddle. I think that helps keep yarn tension more consistent while warping the loom. Back tie-on bar is secured to front beam to keep warping tension more even. You may not notice it so much in this photo, but there’s a slight bow in the back tie-on bar. It became painfully obvious when I used this same hack on the 28″ loom. As a result, I had to figure out how to tie the center of the tie-on bar to the front without interfering with threading through the slots. Yes, I took the tension yarn through the center hole of the heddle and all was fine. Naturally I forgot to take a photo before I started warping the loom, so I crouched below the warp and captured this shot of the tie-ons. Now the warps threads are lightly tied to the loom, ready for tightening up. 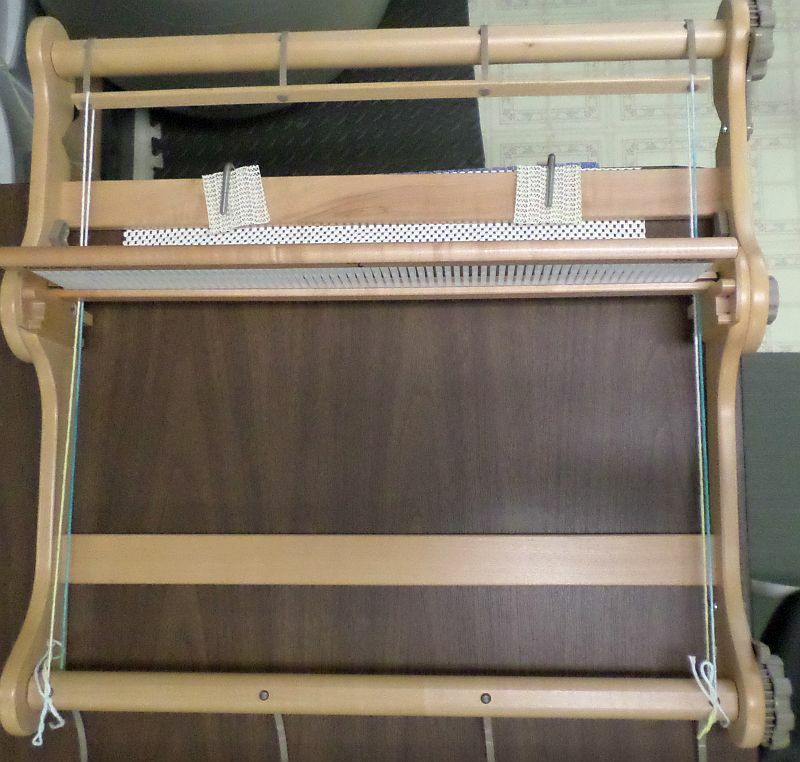 My newest rigid heddle loom project on my newest rigid heddle loom.